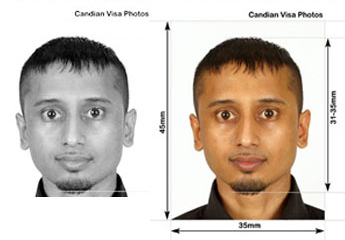 Canadian Visa photos are different then both Canadian Passport and Citizenship photos. Two (2) 35 mm X 45 mm (1 3/8" X 1 3/4"). The photos must be identical and taken within the last six months. They may be either black and white or color. The photos must be clear, well defined and taken against a plain white or light-colored background. The frame size must be 35 mm X 45 mm (1 3/8" X 1 3/4"). The size of the head, from chin to crown, must be between 31 mm (1 1/4") and 36 mm (1 7/16"). "Crown" means the top of the head, or (if obscured by hair or a head covering), where the top of the head or skull would be if it could be seen.